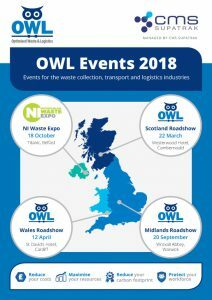 OWL Roadshows are fast becoming the go to event for both public sector and private fleet operators and 2018 will see events held across the whole of the UK. March saw the Roadshow in Scotland, followed by Wales in April. The next event will be the Northern Ireland Waste Expo on 18 October. Contact us now to find out more about opportunities for exhibitors.